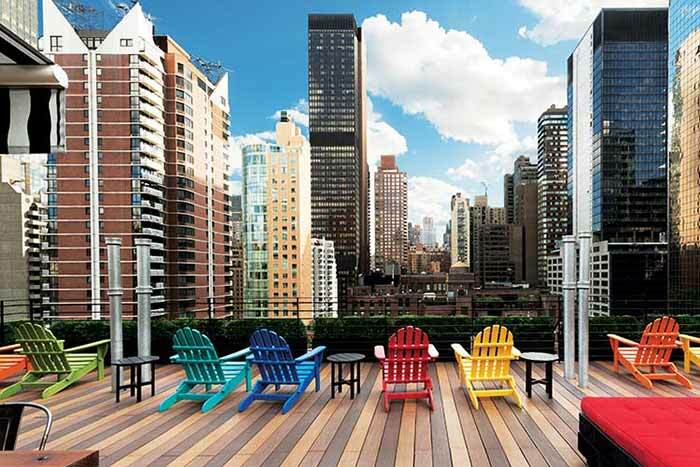 Being on a rooftop, the feeling of being higher than your surroundings and having an excellent view is insightful. 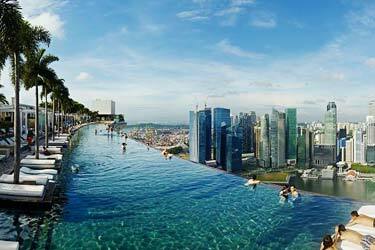 Now imagine being in a swimming pool on top of a rooftop! 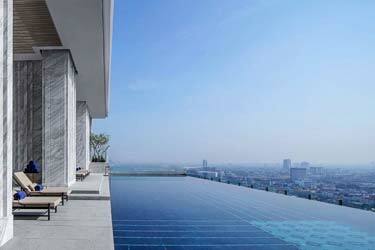 Pools offer a unique atmosphere and rooftops provide you with a spectacular view as well. You can find the best rooftop bars Lisbon has to offer here. 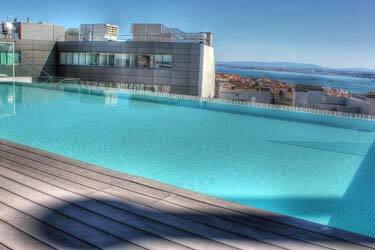 The Epic Sana hotel is very modern with a roof terrace on the ninth floor that contains a heated infinity swimming pool, allowing you to have a relaxing swim with a great view of the sunset over the Tagus River. 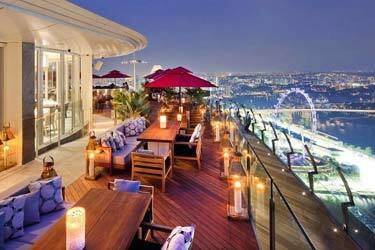 On this very rooftop you can also enjoy the bar and restaurant. The poolside is equipped with lounge beds and white restaurant tables that look like they are from the future. No need to overnight at the hotel to become a guest as you are welcome for the day at €50 and you get to stay to see the amazing star view to end your romantic evening. The Memmo Príncipe Real is a hotel designed by architect Samual Torres de Carvalho in Príncipe Real district. 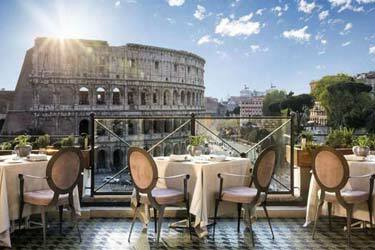 It has a long and thin pool featuring a green mosaics that is outside on the terrace of a roof. You can enjoy Café Colonia with the view over the pool and the city center blended with contemporary and classic design. 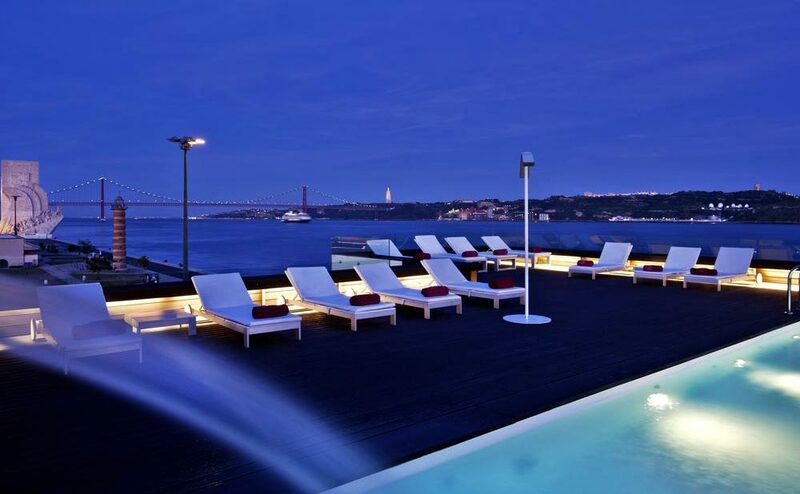 On the banks of the Tagus River you can find the Altis Belém Hotel & Spa which has a small swimming pool on the rooftop. 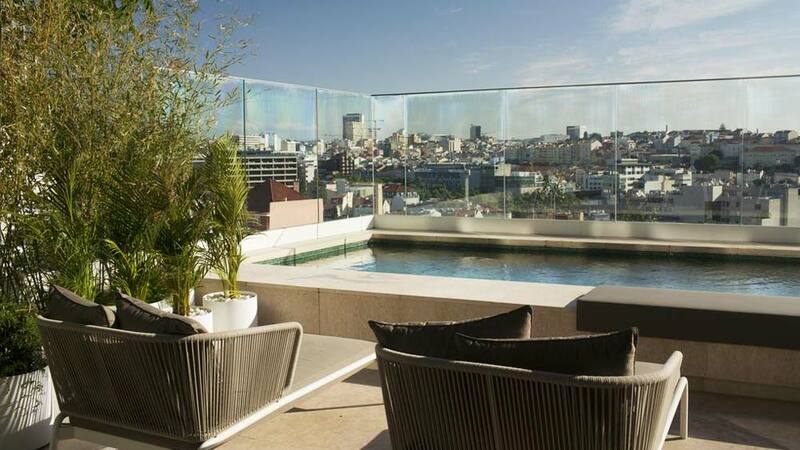 What makes it so unique is the great view of the river flow, the 25 de Abril Bridge, and the minimalist design spa. 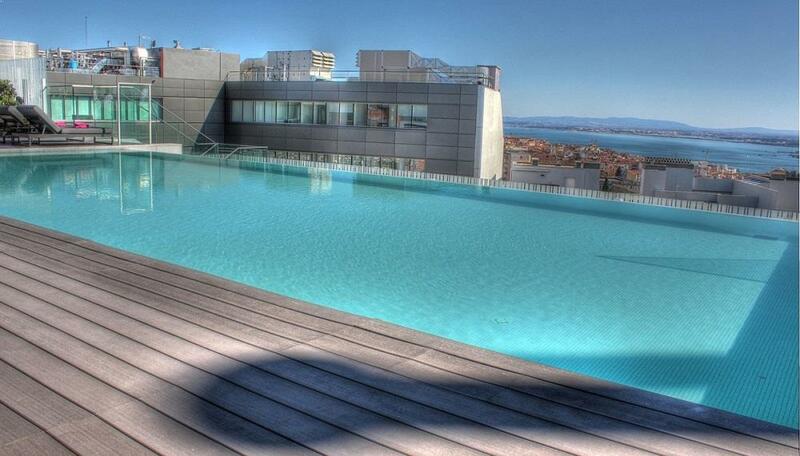 You can stay in the heart of Lisbon by the NH Collection Lisboa Liberdade. Here you can enjoy the rooftop area with a drink at the bar and check out the panoramic view over the historic Lisbon, the river, and the São Jorge's Castle. 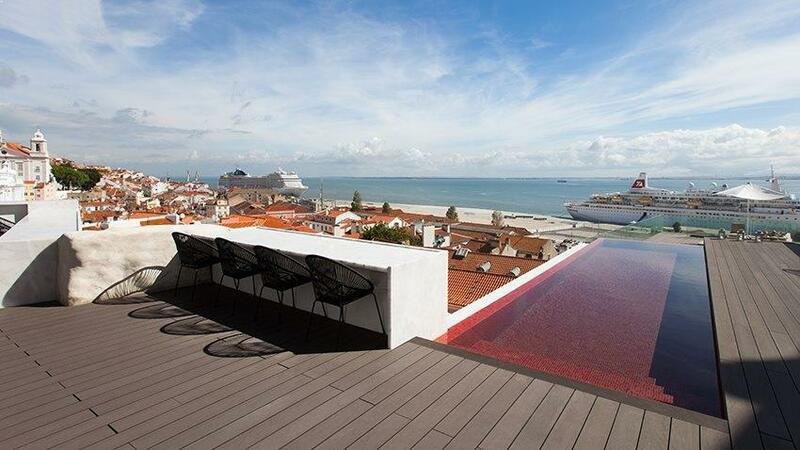 Memmo Alfama is a big and beautiful design hotel with 42 rooms, and it allows you to enjoy one of the best views of the water from Alfama with its inset pool on the sleek terrace. The pool, extra cool since it is red, is placed on the first floor of the hotel. 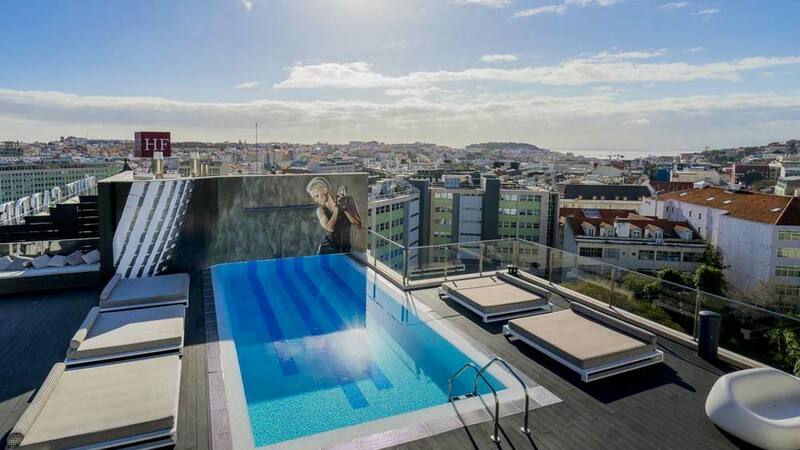 Located in Marques de Pomba, HF Fénix Music hotel offers you a great sensorial experience while having a drink at the bar on the rooftop or a swim in the pool looking over a view of the city. 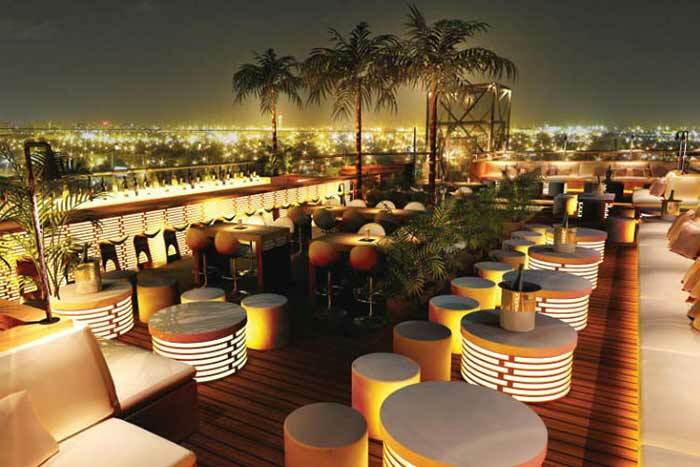 This is a very trendy hotel which celebrates music along with a lounge-terrace style and panoramic view. Palacio Ramalhete is another palace that has outdoor pools that are heated and trees to give you shade in the middle of the city and at the same time giving you a small view of the Tagus River. 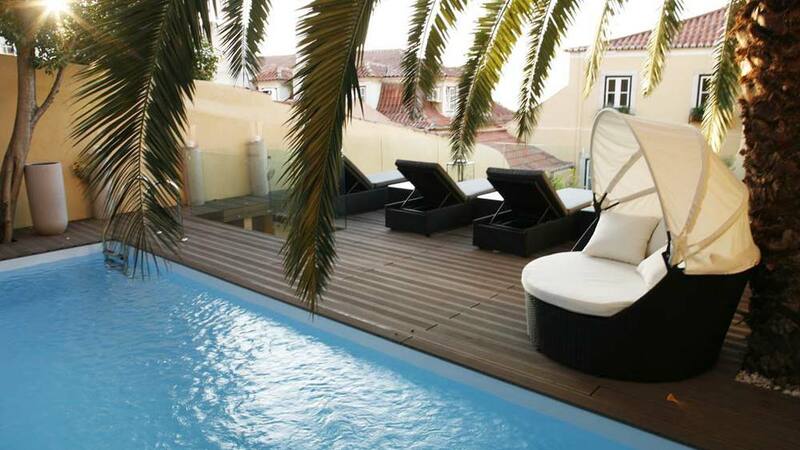 The pool is at the upper level of the courtyard on the rooftop, which is occupied with daybeds, glowing lanterns, and plant pots filled with roses and jacaranda. There are palm trees that provide shade for the pool area, making you forget you are sunbathing and enjoying a swim in the middle of a busy city. Summer in the city can become tremendously hot and just because you are not along the beach does not mean you need to withstand the heat and not make the most out of it. 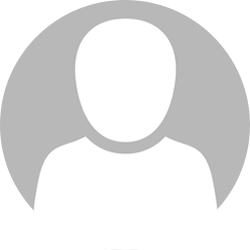 The heat is the best excuse for reaching out to your local hotels with swimming pools. 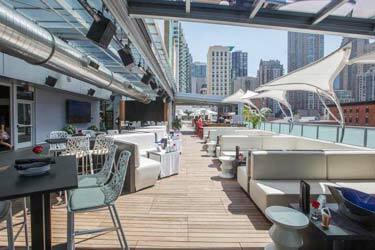 Grab some friends, go for a drink and enjoy cooling off in a rooftop swimming pool with an amazing view! 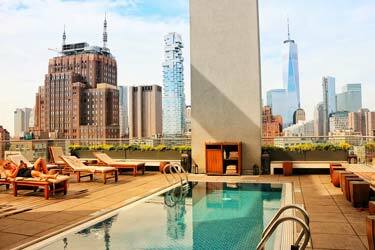 Many hotels offer swimming for non-hotels guests and some hotel swimming pools feature innovation like heating or underwater sound systems if the stunning rooftop view is not good enough.